The Additional Major in Robotics focuses on the theme that robotics is both multidisciplinary and interdisciplinary. The Additional Major is open to students in any major of any college at Carnegie Mellon. Students initially learn the basics of robotics in an introductory robotics overview course. The foundation of this program lies in motion and control. Upon this base, sensing, cognition, and action are layered. Since robotics involves building artifacts that embody these fundamentals, foci, and systems thinking, there is a “hands-on” course requirement. These foci are brought together by a unique systems perspective special to robotics. The Minor in Robotics provides an opportunity for undergraduate students at Carnegie Mellon to learn the principles and practices of robotics through theoretical studies and hands-on experience. The Minor is open to students in any major of any college at Carnegie Mellon. 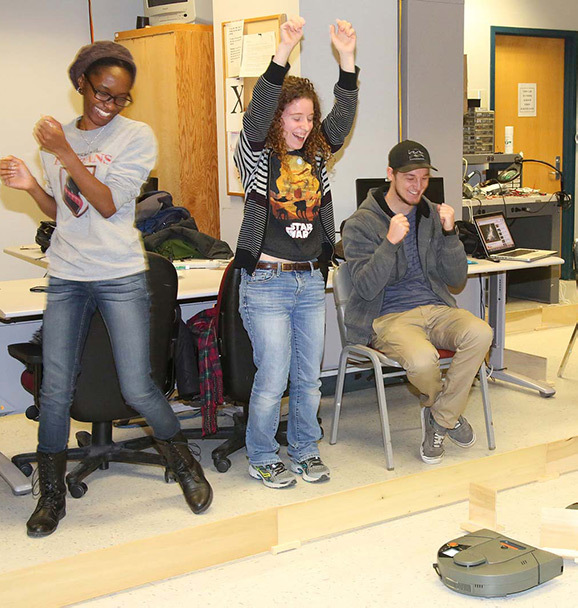 Students initially learn the basics of robotics in an introductory robotics overview course. Additional required courses teach control systems and robotic manipulation. The Accelerated Graduate Program - MS in Robotics, formally the "5th Year in Robotics" is available to Carnegie Mellon undergraduates. This program allows undergraduates early acceptance into the Master of Science in Robotics (MSR) program. Students interested in the program should apply at the beginning of their senior year. The goal is to confirm acceptance prior to the normal job search and graduate school acceptance times, allowing students to tailor the remainder of their undergraduate program to prepare for the masters program. If a student applies to this program and other MS/PhD programs and if admitted to this and other programs, the student must choose one program. Find out more details about the Accelerated Graduate Program on its How to Apply page. Robotic technology can make cars and airplanes safer. It can help wounded veterans and people with physical limitations have healthier, fuller lives at home. It can help clean up crippled nuclear reactors and explore the surfaces of other planets. But around the world and in the Pittsburgh area, the robotics industry is struggling to find talented college graduates who are multi-disciplinary, with skills ranging from software to hardware to interface design. Through the Undergraduate program in Robotics, students are taught how to design, build and program robots. The curriculum includes courses that provide a deeper understanding of control, movement, sensors, systems engineering and cognition and reasoning. 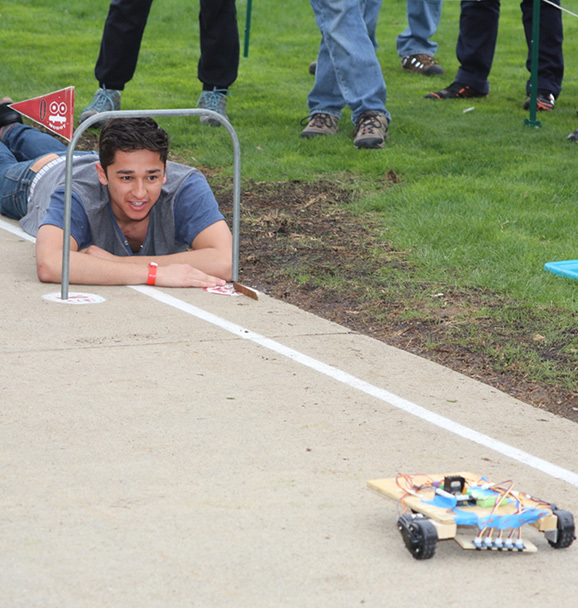 It all begins with Intro to Robotics (16-311) where students are encouraged to vigorously explore major concepts. Some of the most well-known projects are the creation of individual Rube Goldberg machines and a miniaturized Urban Search and Rescue mission. Other courses, like Robot Kinematics and Dynamics (16-384), currently explore methods of controlling the Hebi robotic arm, among other topics. The videos in the playlist below show some highlights from these and other courses. In addition to our exceptional faculty, Carnegie Mellon offers robotics students an incredible array of labs and research facilities in which to learn, innovate and explore. With more than 40 labs and groups on campus, students immerse themselves in hands-on learning and gain a deeper understanding of robotics alongside peers and leaders in the field. To explore some of the exciting projects currently under development at Carnegie Mellon’s Robotics Institute, visit some of our labs below, or view the full listing of groups and labs by visiting the Robotics Institute website. Want more? Check out the Robotics Institute’s video page for the latest student and faculty research and seminars. Or dive into the Robotics Institute research. It’s one of the best ways to learn the incredible breadth of experiences and potential opportunities available to students.